Since its establishment in 1884, the Royal Scottish Geographical Society (RSGS) has worked to support and promote geographical education, research and exploration. Over that time the emphasis has changed. In the first few decades of its life there remained, literally, blank areas on the map of the world that many intrepid men and women set out to explore. In more recent times the focus has shifted more towards the implications of issues such as global climate change. 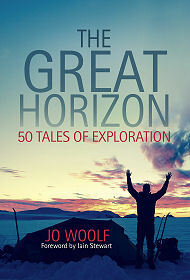 Jo Woolf is a Fellow of the Royal Scottish Geographical Society, and is now their Writer in Residence. "The Great Horizon: 50 Heroes of Geography" is the result of the author's research into the archives of the RSGS. Over the years many well-known (and less well-known) people have received medals for their achievements from the RSGS; or have served as Fellows of the society ; or lectured at the RSGS. This impressive book tells the stories of fifty of those people. The author says in her introduction: "With so many fascinating people to write about, it was a challenge to limit myself to fifty. Even with the scope defined by the timeline of the RSGS, what a vast array of stories can be found! I have deliberately mixed more famous characters with a generous scattering of lesser-known ones, in the hope that, while you are reacquainted with some of your lifelong heroes, you may find some more. Annie Taylor, for example, or Hubert Wikins, or Frederick Marshman Bailey have been half forgotten by history, but they deserve to be brought back into the limelight." Each explorer's section begins with a photograph and a brief explanation of who they were and what their relationship was with the RSGS. This is followed by between six and nine pages of background about the individual, with particular emphasis, of course, on their achievements as explorers or geographers. The biographical sections are well-written and engaging and appear to be very well researched. It is worth saying up-front that while Scots have over the centuries played a disproportionate part in exploring the world, and many are included here, this is by no means just a set of biographies of Scottish explorers. The RSGS took a global view in awarding its medals, and as a result there are people here from every corner of the globe (and beyond, as Neil Armstrong is included). Other notable non-Scots include Norwegian polar explorer, Roald Amundsen; Kenyan scientist and environmentalist Wangari Muta Maathai; London-born African explorer Mary Henrietta Kingsley; and Sheffield-born Michael Palin, whose travels probably need no elaboration. Others included who will also need no introduction include Sir Ernest Shackleton, Robert Falcon Scott, Dame Freya Stark, W.H. Murray, Sir Chris Bonington, David Livingstone, Henry Morton Stanley, Lord Kitchener, and Sir David Attenborough. The result is a book you could easily sit down and read from cover to cover, but which we suspect will more usually be approached by dipping: perhaps by reading the story of someone you are familiar with, only to find yourself over-running into the equally fascinating story of someone you've never heard of before that follows it. This is a thoroughly worthwhile book that will do much to further the RSGS's remit to support and promote education.